The audience’s widespread anticipation of “Into The Woods” could be felt amongst the throng of more than 200 enlivened theatergoers that swarmed outside Dinkelspiel Auditorium. Inside, the orchestra’s preshow tune-up hum and the breathtakingly vibrant scenery accompanied the audience’s chatter. As the lights went down and arose two hours later, it was clear that AATP had delivered a hit. Directed by Ariana Johnson ’17 and produced by Mirae Lee ’17, AATP staged three performances of “Into The Woods” on Jan. 22 and 23. The musical, with music and lyrics by the Stephen Sondheim, tells the story of several fairytale characters and the consequences of each of the character’s wishes and actions. Through the brilliance of Sondheim’s score and the complexities of the interweaving storylines, the production delivers both laughter and more provocative sentiments. As a company, AATP aims to address the Asian American experience with theatre. In its production of “Into The Woods,” AATP make it clear from the “Message from the Producer” in the program that they are “wary to claim the production under a singular label of ‘Asian’” and instead aim to use “Asian-inspired designs and a diverse cast [to] drive home the universality of the fairytales.” The set has subtle reflections of Asian inspiration, such as the origami-esque back wall and enlarged versions of Japanese bonsai trees, decorated with beautifully crafted fabric leaves that sway throughout the performance. AATP also goes further than that, stating that “each fairytale’s design concept comes from a different country in Asia: China, Korea, Vietnam, Japan, and India.” This is almost unnoticeable throughout the play. While the princes wear costumes inspired by traditional Asian garb, it is doubtful that the average audience member could identify the clothing as being associated with a specific Asian country. The “mysterious man” who speaks of good fortune throughout the play, plays the role of an Asian soothsayer, yet his origins are unknown. While the cultural connections could be stronger throughout the musical, it is unclear, when they are noticeable, that they add any deeper meaning to the musical. Instead, AATP shows its theatrical prowess with its clever use of special effects and the theater space as a whole. “Into the Woods” poses challenges in terms of the stagecraft that it requires from its actors. In one scene the stepsisters must have portions of their feet sliced off while in full view of the audience, and in another a cow must consume an entire gold shoe. Both gags are executed perfectly. The director’s choice to make use of the side doors of Dinkelspiel Auditorium to signify outer lands demonstrates the creativity of this production. 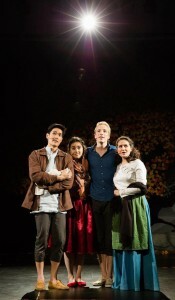 Going further than solely cultural boundaries, what AATP brings to their production of “Into the Woods” is a thoughtful examination of the more universal stereotypes within the fairytales of our youth. When the Baker (Preston Lim ’15) comes to the revelation that it does take two people to make a child, the audience laughed. While in the past, this laughter might have been spurred solely by the sexual quip, it also seems to spring from the archaic thought that women have to singlehandedly raise a child after it is “made.” Similarly, when the baker’s wife (Tess McCarthy ‘16), sleeps with Cinderella’s Prince (Nathan Large ‘18) in a one-night stand, McCarthy chooses to act bemused by the situation, rather than playing the stereotypical “regretful” female. “Into The Woods” delivers a balanced production with stellar acting, well-rehearsed vocals and fantastic music. What it lacked in vague cultural elements, it makes up for in fascinating readings of scenes and inspired staging and special effects.